Loam has been busy these last few weeks working on our fall print edition (stay tuned for pre-orders!) We're so excited to share with you the many incredible artists, activists, and environmental advocates that we've been speaking with. We figured, then, that we would give you a little sneak peek into our Harvest Issue and illuminate the work of Adriana Moreno. Adriana embodies Loam's belief that creativity and sustainability can exist in symbiosis. 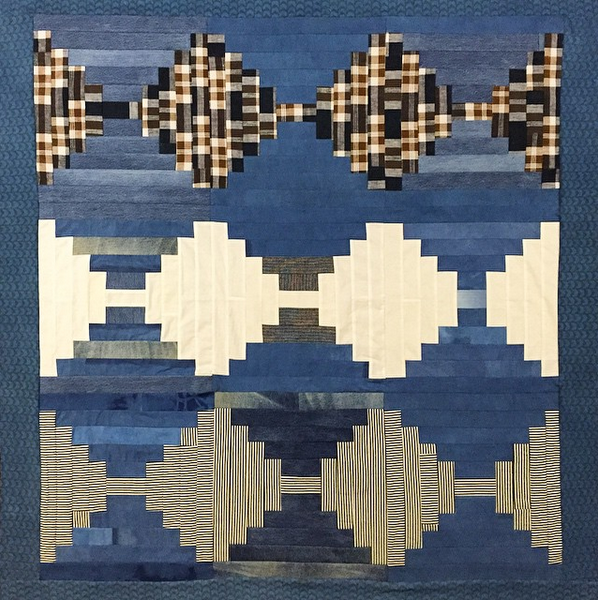 Her gorgeous quilts, naturally dyed linens, and repurposed vintage finds (see above) are proof positive that we can work with what we have to craft something that's both beautiful and lasting. As Adriana tells me, her handmade goods are produced with as little waste as possible. She might use scraps from an old project toward quilting a lovely new blanket. And in this way, Adriana's innovative melding of vintage materials with handmade textiles doesn't just serve the scrapbook aesthetics of Moonshadow Goods: it's respectful of the earth, and by extension, us. "I try not to throw things out," Adriana says. "If there is a hole in my jeans, I'll patch it up. And if it gets another hole, I'll patch that one up too," she laughs. Adriana first started Moonshadow Goods as a creative outlet. Although Adriana had never tried quilting, she figured that she would give it a spin. She bought herself a sewing machine, immersed herself in classes, and quickly discovered that she was hooked (so if you have a passion project that you've been putting on hold, follow Adriana's lead and get together the toolkit that you need now to dive right in). With time, she chose to share her work, curious to see if the processes and products that spoke so profoundly to her would resonate with others. Adriana didn't really have a plan, and this, she tells me, has been a beautiful experience. Moonshadow Goods emerged organically, and continues to take unexpected turns as Adriana connects with fellow makers and nourishes collaborative opportunities. Listening to Adriana work through her hands-on process gets me excited about the potential of the maker movement to rewire the fashion industry as well as invigorate what it means to be a sustainability steward. By transforming preexisting materials into an object that is designed to last, Adriana's production process is a pointed challenge to our throwaway culture. Part of exercising compassion to our environment is recognizing that we've already been given so much. Working with what we have can be as rejuvenating as it is resourceful--and that's something we can all do in the here and now.